I know it is only January, but I have been thinking ahead about gifts for an upcoming baby shower and to include in Easter baskets. I spent a little time this afternoon looking through books and thought I'd share a few of the book bargains I ran across online. I was actually able to order four bargain priced board books (two for my little ones and two to include in the baby shower gift - all 60% off) for only $10.76! A beloved Little Golden Book is now available in our recently launched Golden Baby board book line. In this counting book, the youngest readers will enjoy following an adorable duckling as he explores the farm. I also ordered Flaptastic: Colors (look inside here) and Curious George's 1 to 10 and Back Again (look inside here). 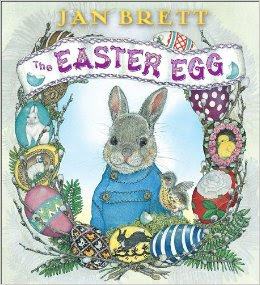 Jan Brett's The Easter Egg (hardcover) is also 60% off! We've borrowed this book from the library multiple times in the past (even though it isn't a religious story) and the illustrations are beautiful. This year we will add it to our family's Easter Book Collection! Jan Brett’s lovable bunny hero, Hoppi, and her remarkable Easter Rabbit will enchant readers as they pore over illustrations filled with dazzling eggs made by Flora Bunny, Aunt Sassyfrass and others. And just in case you haven't heard, the Kindle version of Small Steps for Catholic Moms is currently only $4.39! I have the first edition in paperback, which is usually on my nightstand, but at that price I've been considering the kindle edition for easy access in my iPad's Kindle app as well. Well, it's time for our two youngest to take their naps while I read aloud to the rest of the children. Today we are reading another chapter from St. Thomas Aquinas and the Preaching Beggars (from our January Book Basket), the first couple chapters of The Golden Goblet (for our Ancient History studies), and tonight we will move on to the third chapter of Peter Pan. I hope your week is off to a great start! How are you enjoying Peter Pan? I finally decided to read the book after my boys kept talking about the movie. I wanted them to see the real Peter Pan and it's been a great adventure. God bless! We are really enjoying it so far! 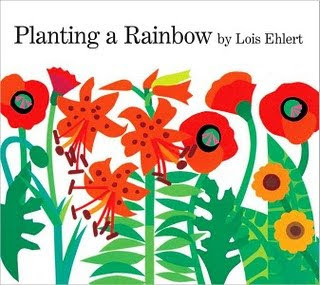 I am absolutely looking forward to planting a garden with my kids and was excited about the book you listed Planting a Rainbow. If anyone reads this and thinks of other great resources I would love to hear your thoughts. You can find some links to other garden themed picture books, along with the Garden Lap Book the girls made, in this old Alphabet Path post from 2009. Ooo, I've had my eye on Small Steps for Catholic Moms for some time now, thanks for the info! Clicked on your link and ordered! Thanks a million for the gardening books link!!! What a beautiful post. Jessica, you have a way of making the sweetest memories. God be praised.